Decision-making requires accurate situation awareness by the decision-maker, be it a human or a computer. The goal of high-level fusion is to help achieve this by building situation representations. These situation representations are often in the form of graphs or networks, e.g. they consist of nodes, edges and attributes attached to the nodes or edges. In addition to these situation representation networks, there can also be computational networks in fusion systems. These networks represent the computations that are being performed by the fusion system. Yet another relation between networks and fusion is that today much information comes from sources that are inherently organised as a network. The first example of this that comes to mind is the use of information from social media in fusion processes. Social media are also networks, where the links are formed by follow/reading/friend relations. 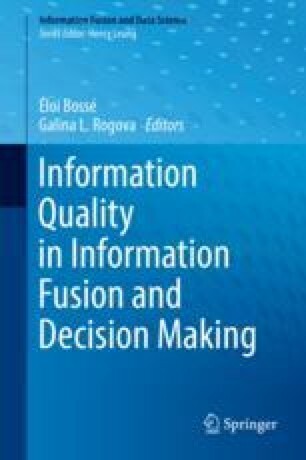 There can also be implicit links between information sources that come from other It is vital for the fusion process and the ensuing decision-making to ensure that we have accurate estimates of the quality of various kinds of information. The quality of an information element has several components, for instance, the degree to which we trust the source and the accuracy of the information. Note that the source could be a high-level processing system itself: a fusion node that processed information from, e.g. sensors, and outputs a result. In this case, the quality determination must take account also of the way that the fusion node processed the data. In this chapter, we describe how social network analysis can help with these problems. First, a brief introduction to social network analysis is given. We then discuss the problem of quality assessment and how social network analysis measures could be used to provide quantitative estimates of the reliability of a source, based on its earlier behaviour as well as that of other sources.